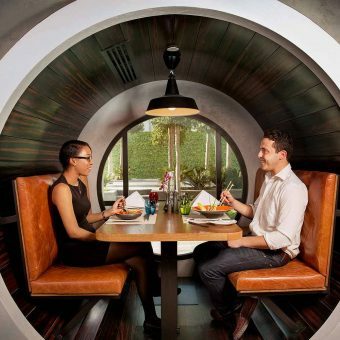 For lunch, dinner or late-night bites, stop by Wok & Co for exceptional pan-Asian cuisine in Dubai’s central business district. A team of talented chefs prepare fresh sashimi, som tam salads and wok creations to order. Pair your meal with imported spirits, beers, wines and cocktails from all over Asia. Experience sights, sounds, scents and flavours from across Asia at Wok & Co, a relaxing restaurant on the ground level of ibis One Central. Our à la carte menu features the continent’s most popular dishes and drinks. Enjoy your meal in the cosy dining room or outdoors on the spacious terrace. For an extra-special treat, order one of our signature wok selections and watch as an expert chef prepares your dish right before your eyes.